Your players will love to spin the ball on this spinning softball award. 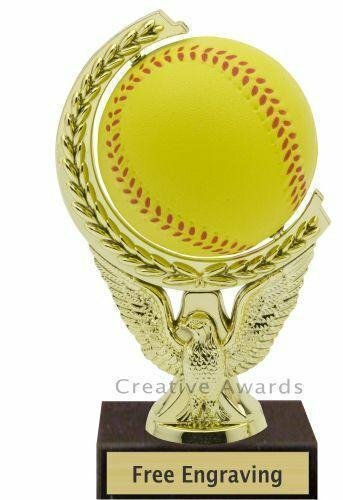 This Spin Softball Trophy is economically priced to fit most budgets. Softball awards come with a laser engraved brushed gold plate. The Spinner Softball Award has a ball that spins like a globe. It is a small inexpensive trophy with great character. It comes with a laser engraved brushed gold plate. The Spinner Softball Trophy has a ball that spins like a globe. The round column provides additional height to this inexpensive Softball award. It comes with a laser engraved brushed gold plate. 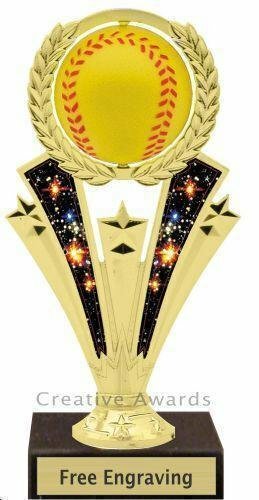 The Spinning Softball Award has a spinning ball with holographic shooting star accents. It is a small inexpensive Softball trophy with great character. It comes with a laser engraved brushed gold plate. 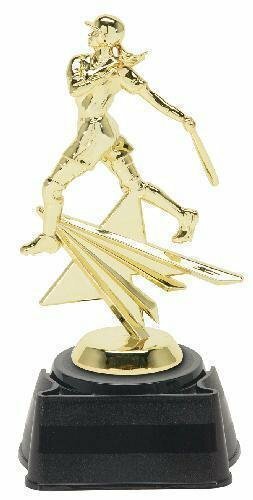 The Spinning Softball trophy has a spinning ball with holographic shooting star accents. The round column provides additional height to this inexpensive Softball award. It comes with a laser engraved brushed gold plate. The Shooting Star Softball Trophy is always a great choice. This softball award is economically priced to fit any budget. Softball trophies come with a laser engraved brushed gold plate. The Softball Trophy is always a great choice. This softball award is economically priced to fit any budget. Softball Trophies come with a laser engraved brushed gold plate. The Accent Softball Trophy has a rectangular column with oriental wings. This softball award is a more elaborate choice that still economically priced. Softball trophies come with a laser engraved brushed gold plate. The Royal Softball Trophy has a figure standing on a crown on top of a round column with flaming golden wings. This Softball Award is an elaborate choice that is reasonalbly priced. Softball trophies come with a laser engraved brushed gold plate.